Add the vinegar to the milk and leave for 15 minutes until it curdles. Place in a bowl and add the oil, brandy, salt and flour. Mix. Add the eggs, one at a time, making sure they are worked in thoroughly. 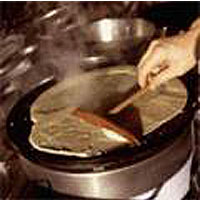 Be sure to mix the batter again as you cook the crêpes. Pour 2-3 tablespoons of batter onto a griddle or a non-stick pan which has been rubbed with butter or oil. Turn over once browned and cook the second side.